Bursitis is the inflammation of a bursa, a small fluid filled sac that sits between muscles, tendons and bones to reduce friction. 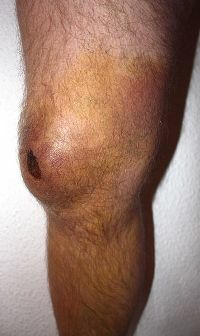 Prepatellar bursitis - housemaid's knee"
Infrapatellar bursitis - clergyman's knee"
Ischial bursitis - weaver's bottom"
A Bursa appears at a junction of a tendon on the bone. A bursa is filled with a thin layer of synovial fluid. It protects and brakes the shocks of the joint. The structures nearby the bursa can move with minimal friction due to irritation. They have different measures and are mostly flattened. When a Bursa gets inflamed, it swells, develops friction and starts irritating the muscle tendon it is supposed to protect. This way the bursa and muscle tendon get more and more irritated. These issues lead to bursitis and tendinitis. Bellow is a summary of causes for bursitis, with the example for the olecranon bursa. Other inflammatory diseases: Gout for instance:☃☃ the gout crystals can form in the bursa and cause the inflammation. Presentation will depend on the location of the bursitis. There will likely be pain and discomfort over the affected area, and there will often be visible and/or palpable swelling. In most cases bursitis can be diagnosed by physically examining the patient. Redness and warmth can be signs of bursitis, but these symptoms are harder to spot when treating a Bursa that is not located superficially under the skin. Swelling can occur when inflammation gets worse. - Calcifications: When the condition is chronic or recurrent. When improvement is noticeable, gradual increase in exercise and activities is recommended. 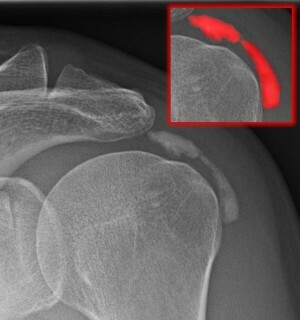 Note: Resting the affected joint does not mean immobilizing it, this could hold a risk towards adhesive capsulitis (especially in the shoulder).